Click here to watch a video booktalk about Rules by Cynthia Lord. The unsung hero of success is empathy. Understanding the needs and desires of others is critical for leaders, salesmen, politicians, lotharios, preachers, CEOs, writers, teachers, consultants … well, just about everybody. The better one understands others, the more effective one can meet their needs, appeal to their self-interests or, I suppose, manipulate them. And with a global economy, our empathy needs to extend beyond our next door neighbor. The question is, then, can empathy be learned – and how? Is there a small muscle somewhere in the mind or soul that can be exercised, stretched and built that allows us to more fully place ourselves in others’ shoes? Reading fiction – especially when the setting is another culture, another time – has to be the best means of building empathic sensibilities. How do you understand prejudice if you are not of a group subject to discrimination? How do you know the problems faced by gays if you are straight? How does it feel to be hungry, orphaned, or terrified when you’ve always lived a middle-class life? Harnessing the detail, drama, emotion, and immediacy of “the story,” fiction informs the heart as well as the mind. Viewing the world through the eyes of a narrator completely unlike oneself, draws into sharp detail the differences, but also the similarities of the narrator and reader. And it is by linking ourselves through similarities – common human traits – that we come to know others as people, not just stereotypes. The question is never asked: If one can read but is not changed by reading, why bother? Oh, my nominee for best empathy building novel I’ve read recently is Haddon’s The Curious Incident of the Dog in the Night-Time. Reading it left me with a better understanding of autism and autistic children. A recent empathy builder you can recommend? Thanks for raising this issue. Too often we lift up comprehension as the ultimate goal of reading instruction when, in reality, understanding what one reads is merely a means to the end of being changed by what one reads. 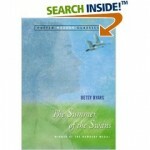 I would also recommend the Newbery-winning The Summer of the Swans by Betsy Byars. It was published back in 1970, but the themes are still relevant today. This story helps young readers to develop empathy for persons with mental disabilities and helps first- and last-born children develop empathy for the middle child.